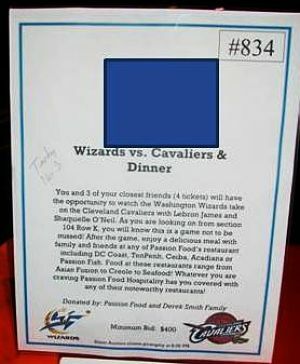 This is Part 2 of a 2-part series examining how missing information on silent auction descriptions costs you donations. Read Part 1 here. My floor team are outstanding sales support in any auction. They find an item and work it until it has bids or they’ve sold it outright to a guest. But if a silent auction description is lacking key information, my sales reps must leave their post to find someone in the marketing department who knows about this item and can provide the missing details. Here are some additional common omissions on descriptions. 4. Guests want to know if the gift cards for chain restaurants are good for ANY of the restaurants in the chain, or only ONE of the restaurants in the chain. ow she might walk off elsewhere, we’ll never find her, and she’ll never come back to bid. 5. Guests want to know the day of the event, as well as the date. Tickets to sporting events and theater performances often list the date, but they don’t always mention the day. Yet many of us schedule our lives around days more than dates. “I take the kids to dance class on Monday afternoons,” remembers Mom. “I have my computer class on Thursday nights,” remembers Dad. If you provide a day as well as a date, it helps guests decide on whether they are interested in bidding. If they have any doubt about it, they won’t bid, so it’s important to provide the information upfront. 6. Guests want to know what is included. Two guests were inquiring as to whether the salon focused on cutting hair or esthetician services. What kind of a salon was it? There was no “menu of services” on display and we had no idea. So during the course of the silent auction, we are researching this item, instead of focusing on the more important task of sales. On the positive side, at least these guests were asking questions. Often guests won’t even bother to ask … they just won’t bid. Writing complete descriptions is important because you may just have one chance to get a guest to bid before they are distracted by something else. Now of course, as useful as this blog post sounds, writing descriptions isn’t the only thing that gets guests to spend money in the silent auction. It’s one element, but it’s hardly the silver bullet. So to get my clients to run more profitable silent auctions, I pulled together a nearly 3-hour course that teaches volunteers how to re-vamp their silent auction to raise more money. They know the tricks that help an auction perform while having fun mastering the psychology of auctions, too. Case in point … women bid more than men in silent auctions, but men are more likely to overpay, thereby raising more cash. So the key is to start attracting men. And ladies, since we know that men don’t like to read (cough, cough), do you think that this blog post on writing good descriptions gets them involved? Enter this brilliant little training gem … Silent Auction Savvy. 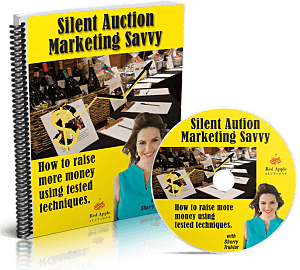 Silent Auction Savvy workbook, DVD, and online downloadable tools give you the bid sheets, display templates, checklists and other tools you’ll need to ensure you raise more money than that gal who ran the silent auction last year. It means more money for your cause, be that a school, church, PTO, or some other type of nonprofit. Sure, you can read this blog and see what information you can gather. But really, I don’t put the real deal meat on the blog. The real deal meat is in the product. To amp up your silent, check it out here. The picture on this page is a broken link. Thanks for the heads up, Guy. We fixed it.